Accurate and easy to use, the Drager Pac 3500 is ideal for industrial personal monitoring applications. Providing quick detection of carbon monoxide, hydrogen sulfide or oxygen, this robust single gas detector has a lifetime of 2 years and is made specifically to fit industrial safety requirements. Drager Pac 3500's impact-resistant housing features a protective rubber coating and is impervious to corrosive chemicals. Drager Pac 3500 meets the requirements of IP 65 to ensure operation even when projected with water. A crocodile clip securely fastens the instrument to the user's clothing and can be adjusted to allow for individual preferences. To ensure continuous operation even when the gas inlet is accidentally covered, the instrument's sensor has been carefully positioned to allow gas intake from both the top and the front of the device. 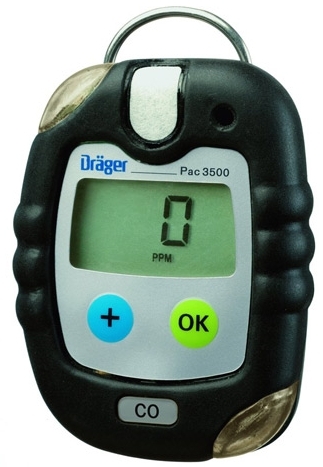 Incorporating the latest miniature Drager XXS sensor technology, the Drager Pac 3500 has been specifically developed for use in personal monitoring and handheld applications. The robust and pressure compensated sensors reliably detect CO, H2S and O2 and because of the very low sensitivity drift, the Drager Pac 3500 can be used over a 2 year period without calibration. Easily seen at a glance, the large display shows both the gas concentration and the measurement unit. Alternatively, the instrument can be configured to show only the gas detected. The concentration is then only displayed when the set alarm level has been exceeded. Language-free to avoid any misunderstanding, this continuous numeric display can also be back-lit to improve readability in darker conditions. Colored labels are also available to distinguish the instrument at a distance. In addition to a vibrating alarm, the Drager Pac 3500 emits an audible, multi-tone signal and a clear, 360° visual alarm via bright, flashing LEDs at the top and base of the instrument. The alarm threshold levels can be individually adjusted to adhere to company policy or standardized with the use of Drager software. Complete with an infrared interface and able to store up to 60 events with dates and times, the Drager Pac 3500 can be easily linked to a PC via a connecting cradle. This means that significant events such as switching on or off, gas and battery alarms, error codes, configuration changes, fresh air calibrations and bump tests can be downloaded, printed and stored centrally for future reference or reporting purposes. Bump or function tests are necessary to check if the instruments are functioning correctly. Most national regulations require users to test equipment against a known gas concentration on a regular basis. Featuring adjustable bump test and calibration intervals, the Drager Pac 3500 alerts the user when bump tests or calibration are required. If this warning is ignored or a test is unsuccessful, the instrument automatically displays an "out of order" error message. Performed together with the Drager Bump Test Station, a typical bump test takes between 8 and 15 seconds and requires no additional power so that the test can be performed on site. Each test result is automatically stored in the event logger and, should hard copies be required, an optional mobile printer can be used. If necessary, a fresh air calibration can be carried out during the start-up sequence. All other calibration options are only accessible via a password-protected menu.